As summer comes to a close, I must say that it has been VERY good to me from a mommy Break perspective. This week was no exception as it delivered a triple header! Three opportunities to decompress from being mommy and reconnect with old friends. In full disclosure, I actually felt a little guilty and reticent that I had three opportunities to get away. When planning the week ahead, for about 10 minutes I wondered whether I should cancel on of them. Was it too much time away from home? Was I leaving my husband with too much to bear? Yes, i know. These were the thoughts floating through my head. I dared not share my inner voice with my husband who would surely validate the insecurity and validate the need to re-evaluate "trying to do too much". Have no fear. I quickly snapped out of it and said to myself "Do you Nicole! Do You!" Wednesday: Although I didn't really fully execute my summer bucket list. There were a few things I really really wanted to make I sure I did. One of them being Jazzin at the Shedd. Great weather wine and live music will always be the makings of a great event. I decided to maximiz the moment and invite a dear friend who was moving out of state. Great time! Skyline views from the Shedd. 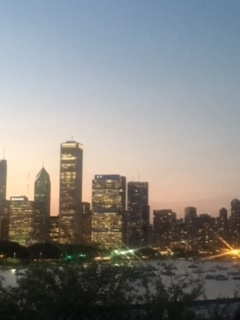 I love Chicago in the summer! Thursday: Another dear friend came in town to visit and coordinated a group dinner so she could maximize her time so that we could meet her super cute daughter. Although kids being apart of your mommy Break is a violation of the rules, there is an exception when they are not your own. SIDEBAR: Do you ever notice your heightened tolerance level for kids when they are not your own. Patience of job! Friday and Saturday: Wedding weekend! One of my dear dear friends got married this weekend in Cleveland! 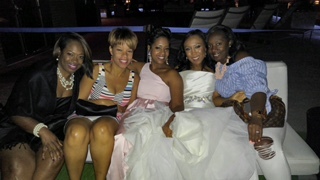 Not only was the wedding beautiful, but I got to spend time with close friends from college and my besties! Several laughs and cocktails later and alas the weekend was over!